The holiday indulgences of the last few weeks may have you thinking about improving your diet and or even lifestyle change. However, in the modern era, that’s easier said than done since it’s difficult to find convenient, healthy foods that stays fresh, taste good, and fill you up. NYC startup Daily Harvest has changed this. The company delivers fresh, ready-to-blend plant-based foods to make smoothies, parfaits, sundaes, and even soups. The subscription service lets you easily upgrade your morning routine without compromising your health. Stuffed with fresh and nutritious ingredients that are harvested at optimal ripeness, your breakfast comes straight to your door and can be prepped in minutes. 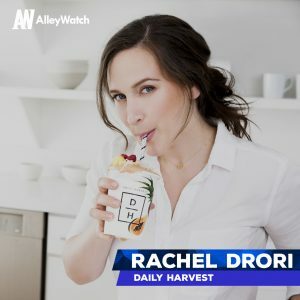 AlleyWatch chatted with founder and CEO Rachel Drori about the company, its origin, the company’s impressive growth, future plans, and its latest round of funding. This was a $43 million Series B funding round led by Lightspeed Venture Partners with significant participation from VMG Partners. 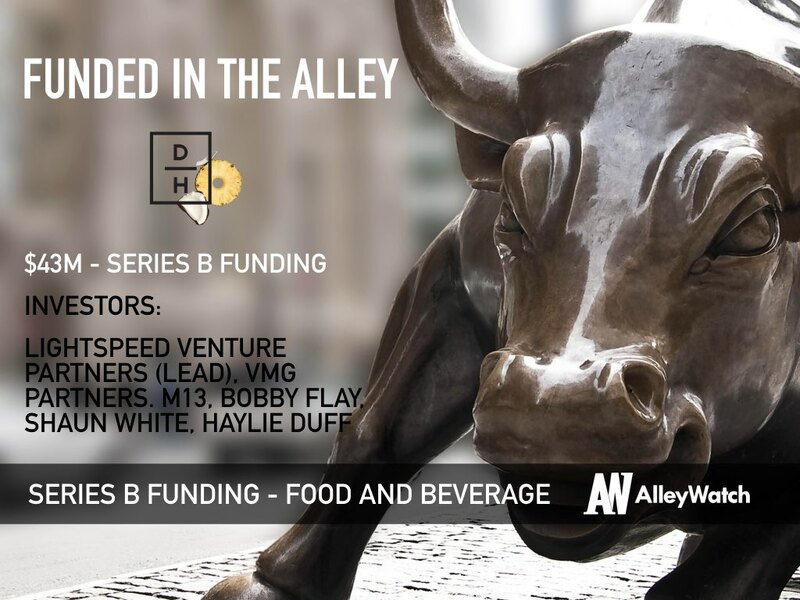 Additional investors joining the round include M13, chef and restaurateur Bobby Flay, Olympic gold medalist Shaun White, and actress Haylie Duff. Daily Harvest makes clean eating possible for those leading a busy overcommitted life. We use a long-overlooked appliance, the freezer, to make one-step-prep, plant-based foods like smoothies, overnight oats, chia parfaits, sundaes, and soups that offer superior nutrition in a format that fits modern lifestyles. Daily Harvest was born from my own personal challenge of eating nutritious, plant-based foods while having a busy, unpredictable life. Convenient food was full of preservatives and processed ingredients – the last things I wanted to put in my body. While the organic, whole, clean food I aspired to eat required time to shop, prep and cook – time I didn’t have as a busy professional. I knew there had to be a better way and the solution that I found was in frozen. We have three primary differentiators from other popular subscription-based, direct-to-consumer meal brands. The first – and the most obvious – is our frozen format. We use a farm freezing process that allows us to pick our ingredients when they are at peak ripeness to preserve nutrients and flavor that are degraded in the traditional grocery supply chain. For example, frozen blueberries have three times the amount of Vitamin C than fresh blueberries contain after just three days of storing. Unlike other services, we’re entirely plant-based and use organic, unrefined, clean ingredients in every recipe. Lastly, we prioritize convenience through our “one-step-prep” combinations. Other companies typically require half an hour of cooking time – our food is ready in minutes simply by adding the liquid of your choice and blending or heating. Our collections are made for anyone looking to incorporate more nutrient-dense, plant-based foods into their diet, but doesn’t have the time to research, buy, prep and cook them. The convenience and accessibility of Daily Harvest could benefit all busy professionals and families who are looking to eat more nutrient-dense food. We sit at the intersection of the $53 billion frozen food market and the $43 billion organic food industry, expected to grow to $320 billion by 2025. We’re a subscription-based, vertically integrated, direct-to-consumer, e-commerce business. We chatted in June of this year after the last raise and the company has expanded rapidly since then. How do you see your role and day to day responsibilities changing as we head into 2018 and the company continues its impressive growth? Right now we’re laser focused on expanding our team. In the new year we will switch our focus to developing new collections and working hard to scale and continuously improve the core business. 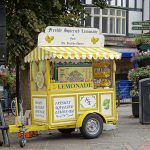 This time around I had the experience of two prior raises under my belt so was able to leverage my previous experience into a much more streamlined process. I made sure to get to know the players who fit our criteria before we formally began raising. This allowed a super efficient process since we only formally pitched a handful of funds we knew would be great partners for Daily Harvest. The biggest challenge this time around was taking time away from a rapidly scaling business. There just were not enough hours in the day so I had to pull all-nighters and do crazy things like fly across the country and back in 24 hours two times in one week to fit it all in. Our investors are enthusiastic about how we’re leveraging the long-overlooked and misrepresented frozen food market to make nutritious, plant-based food convenient and accessible to nationwide. Frozen is a $52 billion industry that has seen little innovation since the introduction of TV dinners – it’s ripe for disruption. We’re using it to address a problem felt by many time-starved, health conscious millennials, which is a large and growing segment of the population. We’re focusing on accelerating our product development with some exciting new collections in the works. Look out for something new in January! 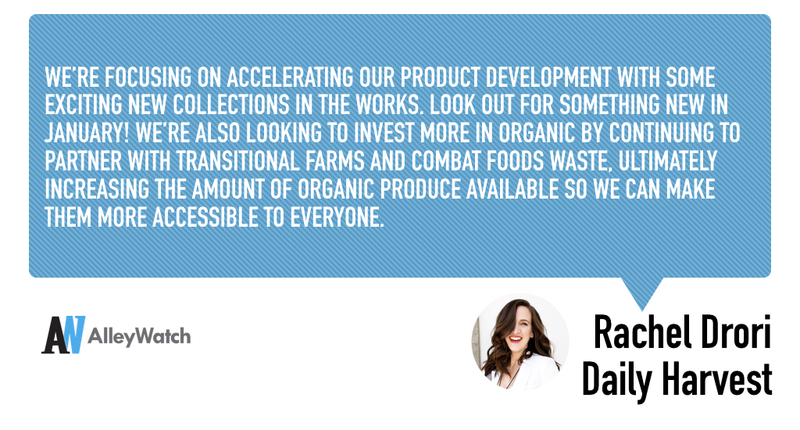 We’re also looking to invest more in organic by continuing to partner with transitional farms and combat foods waste, ultimately increasing the amount of organic produce available so we can make them more accessible to everyone. We’re going to continue changing the perceptions of frozen food. In eliminating the bias that comes with frozen, we can show people that nutritious, clean food is actually easier to access than taking a trip to the grocery store. We’re shaping a new narrative about the benefits of frozen fresh to solve the real life dilemma of having to choose between convenience or compromise.